Welcome to our Lunch & Learn blog series! Once a month, someone at Reliant Studios presents on a topic of their choice to the rest of our team. This series of blog posts will be a compilation of what we've covered in each of these gatherings. Take this journey with us, as we continue to learn from one another! Remember that one shot in that one movie with the guy who has the face and he does that one thing and it’s really, really cool? No?! Dang. Well, trust me, it was amazing. Well, how they did it was through a lot of hard work, and it all starts with cinematography. Cinematography What is cinematography? Aside from replacing “pho(to)” with “cinema” and waving your hands on screen to imply there’s movement involved, the actual definition is, “the art of making motion pictures.” (Thanks, Webster.) However, if you take the word back to its Greek roots, it means, “writing with motion.” How poetically cool is that? The answer: very. This sums up movies perfectly: telling stories through motion. Crafting the Shot When directors set out to make a movie, they collaborate with a lot of people. When it comes to what will be seen by the audience, they work with the director of photography (also known as the cinematographer) and use an array of tools to craft each shot. There are the obvious tools, like a camera and some lights, along with an entirely different set of tools they choose from - a conceptual set of tools. These include (but are not limited to): the frame, light and color, lens choice, and movement. Here’s a quick primer on each one of these things, so you can totally outsmart anyone the next time you find yourself debating the merits of the latest Pixar/Marvel/Oscar-nominated movie. These images say a lot. The frame on the left not only establishes we’re in an office, but we see it from above, looking down. We’re looking down on the workers in a subservient role (perspective) doing repetitive work, reinforced by rows of replicated cubicles (rhythm). They’re all the same; no one is an individual. 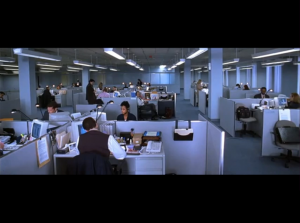 The frame on the right is specifically designed with vertical columns, like bars in a prison cell, on a computer screen, which shows our protagonist trapped in a dead-end job (composition). Exciting, right? Well, you’ve read this far, so I’m going to assume your answer is yes. Let’s move on! Light and Color We all know what light and color are, but if we use them intentionally, they can reach people at a gut, emotional level. A bright, vibrant image can make us feel happy, while a dark, shadowy image can make us tense and afraid. Color is the same. We have natural associations with certain colors. Blue equals sad, red equals angry, orange equals Oompa-Loompa, and depending on your association with them, these colors could make you feel a variety of things. Since movies are a relatively new art form (relative, that is, to the history of existence), it’s no surprise other art forms have been utilizing light and color for a long time. Going back to the Renaissance and Baroque time periods, Italian painters developed a style of drawing and painting called ‘chiaroscuro’ (kira-skew-row), which means light and shadow. This was popularized by such artists as Michelangelo Merisi da Caravaggio. You can see his dramatic use of light in his painting The Calling of St. Matthew (left) from 1599. Compare that to the opening scene of The Godfather (right) from 1972, and it’s clear that some things never change. The Lens Every lens has a “personality” - a flavor and an inflection that it adds to the image. If you’ve ever seen an image from a fish-eyed lens, you know it not only captures a wide view, but it distorts things as well, which can lead to a comedic effect. A long lens (the really big ones that need a tripod all their own) does a great job of isolating subjects and making everything else fall out of focus. Directors and cinematographers use these lenses when they want you to pay attention to nothing else in the frame, such as a man looking at a woman and falling in love with her. Movement This is half the definition of movies right here! If you happened to catch this summer’s latest ‘Transformers’ movie, then you probably noticed that there was plenty of camera movement to go around (and around and around…). That’s because the director, Michael Bay, loves to add movement to his shots - to the point where you could probably measure his attention span in nanoseconds. Anyway, judicious camera movement can be a powerful tool for a movie. Like dancing, it’s one of the few art forms to employ motion and time. Movement can emphasize character emotions and actions, serving as a dynamic way to tell a particular story. 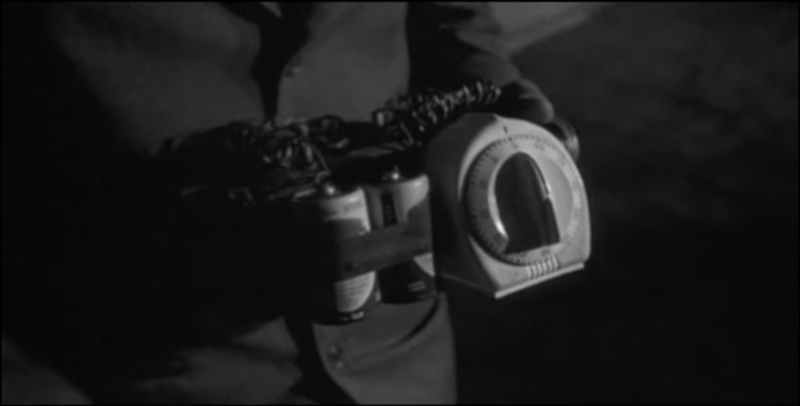 Click to watch the opening scene of Touch of Evil. Thanks for reading, and keep watching! Movies that is. Keep watching movies. That was a terrible attempt on my part to come up with my own signature line. Never mind. Reliant Studios is a Midwest film/video production company in Lincoln and Omaha, Nebraska. We travel the world to partner with organizations that are passionate about what they do and have a great story to tell.